Look, in this land, we have laws. And your kid can’t just toddle around here, looking as cute as he does, without it being a crime! Our laws are what hold our society together - they’re what makes America great! - and if we just allowed every super cute baby to just go around, waving and winking all innocent bystanders, fellow diners, and innocent park dwellers, then this nation would fall into total chaos! Frankly, your baby’s a disruption, and those chubby cheeks are slobbering all over the fabric of this great nation! So here’s what we’re gonna do…we’re gonna lock that baby up and throw away the key! That’s right, that baby’s been booked…and they can just go right into the (Play) Pen with the rest of the other angel faces. Maybe then those adorable cherub troublemakers will learn their lesson and figure out that, in this country, looking like a cutie patootie has consequences! 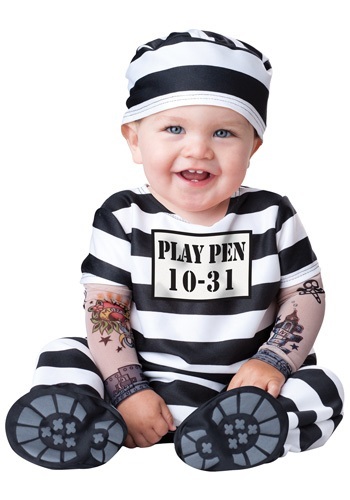 And while they're in the clink, they're gonna need this Infant Time Out Prisoner Costume! This black and white satiny jumpsuit has Velcro at the back and snaps inside the legs, making it comfy to put on and take off. The attached mesh sleeves feature hilarious tattoos, which will show all the other babies in the Play Pen yard that your little buddy isn't to be messed with! The attached skid resistant booties have sol grips, which will come in handy when your baby is running from the guards after a killer game of Peek-a-Boo. 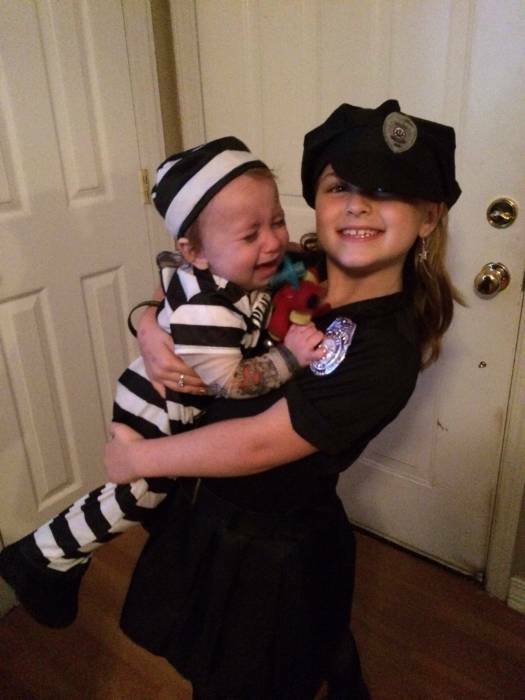 The costume even includes a stretchy striped convict cap, which your baby will need while they're out for long walks with the stroller chain gag. Cheer up, parent! Maybe your baby will get time off for good behavior (but with those cheeks? Wouldn't count on it!). Bad boys what you gonna do!!! !